The President was upbeat and attentive throughout our discussions, and seemed eager to share what he billed as very positive directions for the College—to be revealed. Naturally, Dr. Kim is very excited about the new Student Center being almost ready for prime time. He expressed appreciation for the consistent staff support for the project! Watch for the soft launch in the summer. There seemed to be some deeper appreciation for what staff actually adds to the student experience and success potential on a day-to-day basis. Problems with providing needed services at our below skeleton crew levels of staffing were noted—on at least one occasion, Mr. Pernot jotted down notes on the problem for future action. One of our questions related to this idea of emphasizing “access to success” rather than just getting more students enrolled. (Check out the Enrollment strategy that was rolled out at last week’s College-wide Forum.) Money Matters is a student financial literacy program that Flor Carabez, Union Membership Chair, has implemented and explored through outside conferences and networking in the field. None of her valuable activities has been compensated or supported by the College. Dr. Kim was impressed with the program she described, and it demonstrated in a concrete way that staff are intellectual and creative too—not just the faculty. Yet staff is not well-supported with professional development opportunities, a lack we emphasized. Dr. Kim also acknowledged that training is needed for new managers, citing Apple’s research on indicators of partner success. Top indicator is that a company provides professional development up front. Staff is also knowledgeable about the challenges at hand, from a frontline perspective. This is generally not acknowledged nor do we yet have a good way to provide crucial input to administrators; USofCC gave examples of mistakes that could have been avoided. Dr. Kim recognized that it’s an ongoing issue, but indicated that Academic Affairs would take the lead rather than HR. HR asserted that they have worked with academic leadership in the past to re-instate positions. The issue of gaining input from staff expertise on issues of importance to the College was not fully addressed. Obviously “chop from the top” is not quite embraced as an approach, though the President acknowledged that there is some bloat. However, administration does appear to realize that further cutting would be straight through the bone, and that there is no more fat. In fact essentials are being diminished, causing deterioration of the students’ experience, and damaging the perception of the College by potential students when they visit. We stressed that empty “welcome” centers do not give the message we want. While Dr. Kim spoke at length about his hopes for the new Provost, and has done so in the past, he also expressed a caveat that none of us should place too much on their shoulders. That said, he aims to correct what he termed “overbuilding” of rules and policies in order to integrate new systems better. Dr. Kim emphasized that a student and USofCC rep were included in the Provost search committee. He’s looking for someone who is expert at communications, who can talk and listen to people and engage in ongoing discussions. The value of supporting employees to expand their professional networks, contacts, and participation in external professional associations to grow their expertise and understanding of ways to creatively address issues and offer better services. Both the “company” and the employee benefit. These ideas were amply outlined and illustrated by your Union Executive Board members and colleagues, and were well received. Your Union will work to make these approaches, and more, a matter of policy and practice. “Over the past ten years, while the college has experienced structural and financial challenges due to declining enrollment, it is our staff who are facing the difficulties and challenges of trying to make ends meet and properly serve our students with declining resources. We believe that the principal challenge in these upcoming negotiations is to negotiate a contract that takes full account of the needs of our staff members and recognizes our contributions to the College at time of retrenchment by the College. Columbia has undergone several reorganizations, which has included selling at least 4 buildings, resulting in new revenue of more than one hundred million dollars, The College has also saved money through the consolidation of departments, centralization of operations, 2 employee buyouts, the freezing of vacant positions, and the layoff of more than 150 of our fellow staff members, many of whom had devoted many years of service to the College. 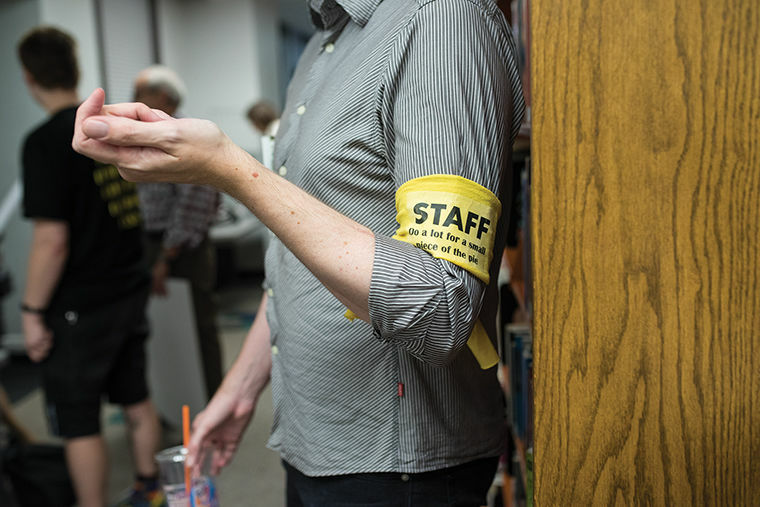 These cost-cutting measures have made union staff positions more vulnerable. Today, Union positions make up less than 18% of persons employed by Columbia. With each layoff or job elimination, our remaining staff members are required to take on additional duties. HR tells us that our increased workload is considered “in the scope of our job descriptions” and therefore staff is not entitled to additional financial compensation. Productivity and morale begin to suffer under these conditions, and we would like these negotiations to address this problem. In a report shared with us, the administration has stated it will spend over 25 million dollars to upgrade equipment, facilities, increase marketing and double student scholarships. We believe that these dollars also need to be committed to our staff and to the student services that we provide. One of Dr. Kim’s promises to the college community when he began his tenure, was to promote the concept of shared sacrifice from among all levels of the College. We took that to mean that all levels of the administrative staff would share the burden of layoffs and cost reductions. Yet each year, since 2013, the staff has comprised a substantial majority — usually up to 80 to 90 percent of those laid off and the number of staff positions has dropped significantly. Yet we can’t help but notice that the upper administration continues to grow in size along with the number of outside consultants hired to support these new initiatives. This Summer, Union leadership surveyed and met with members in small groups to discuss their needs and concerns. We learned a lot. The work they do for students is rewarding and it is the reason they enjoy their jobs and why they choose to work here. The staff are also proud and have unwavering support for their union. Their top financial concerns are the cost of their health care, the preservation of their benefits, and salaries–which continue to lag. This salary crisis requires that many staff members obtain a second job or look for a better-paying first job. For a while, we could absorb more work, but there is a limit, and we have reached that tipping point. The staff is cut to the bone. Some staff take work home, stay late as they are committed to the College and its mission, yet we are told there is no overtime. Most staff are becoming discouraged and disheartened. Understaffed departments are seeing a noticeable rise in turn-over rates. They are frustrated with their managers who promise them more pay, but months later learn their managers don’t have the authority to make financial offers. A dedicated staff is invaluable. We are the ones on the ground with vital institutional knowledge. Staff members are often the first faces that our students and their families see, or speak with or email. Staff members are the ones who make sure Columbia is showcased beautifully – from events to our campus in the heart of one of the world’s great cities. This is our value and this is how we see our role. We are deeply committed, deeply devoted and ready to partner in good faith with our administration leadership, and with all of the Columbia College family. It is in our interest to see the College grow, to see it succeed and to be a part of that success. We want our students to go out in the world and make a difference. And while we are enormously proud of the work we do, we want to be full participants, fully engaged and aligned with Columbia’s future, and fully able to build a good life for ourselves and our families. 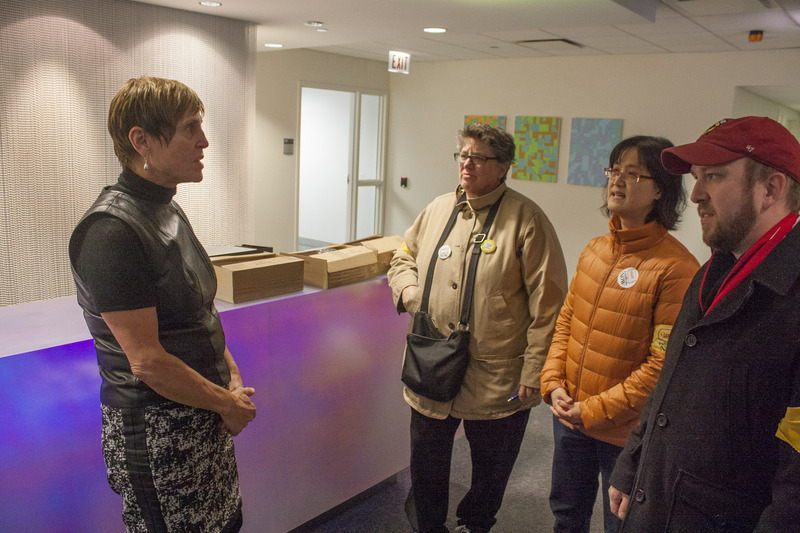 Last week, the Executive Board of the USofCC Union met with Columbia College Chicago President Kim to discuss various issues important to the Union. Dr. Kim spoke frankly about recent layoffs, new hires, and the direction of the College. We discussed fundraising efforts, and Dr. Kim expressed confidence in the increasing donor interest he’s witnessed including more contributions from alumni. He was also excited to announce a new position in enrollment management with a fresh innovative direction, and he is very supportive of Mark Rosati’s work in his role as VP of Strategic Communication and External Relations. He would like to direct more resources to support a larger marketing campaign that would not just cover Columbia as a whole but would focus on individual programs. Dr. Kim did express concern that recent marketing efforts did not showcase the College’s unique strengths. The Union expressed concern about the College’s emphasis on hierarchy, and we conveyed that staff members are made to feel replaceable and not valuable to our college community. An example we used was the tendency to lay off essential personnel without having a plan to cover the important work that is lost, let alone the institutional knowledge. The small salary increases used to cover additional work exacerbates the feeling, and there is the issue of honoring compensation retroactively when additional work is incurred. The Union also reminded the President that some staff members have been here for one, two and three decades. For many staff members, Columbia College is their second home and a career with which they have defined themselves with pride. Staff contributions and dedication need to be recognized and celebrated. Staff morale also needs to be addressed, which we highlighted, suggesting action items like professional development opportunities and supervisor evaluations. The search for a new Provost has begun and Dr. Kim said he was not limiting the search, but he would like to see a female candidate immersed in the arts and not isolated to academia. He plans to seek candidates who can realize ideas and translate concepts into actions. Asked about the school structure, Dr. Kim said he would leave the discussion for the next Provost, though he still believes there are benefits to additional program/department realignments. He was surprised by the recent departures of some upper level administrators but feels confident the College has the capacity and talent to continue to improve upon the work started in the office of Equity and Inclusion while a search for a new Dean in both the School of Fine and Performing Arts and DEI are conducted. The Union encouraged Dr. Kim to communicate and share his views more often with the college community. We assured him that we would welcome his thoughts and insights, more so than a requisite announcement of a new hire, departure or of an honor. Dr. Kim spoke with greater confidence about the direction of the College and his role in shaping Columbia’s future. The USofCC has additional information available to help you compare the job level assignments of coworkers (whose duties you are familiar with) and of other staff with similar job titles. You can determine if the level assignments seem equitable or if there are any inconsistencies by reviewing files. Please email USofCC to get a private link to One Drive for your own personal confidential use. What’s the Job Classification Study? I’ve never heard about it before. 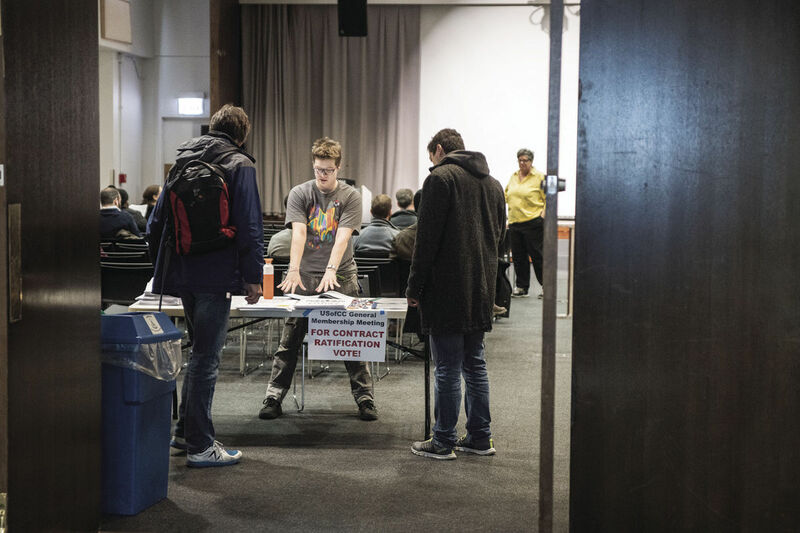 At the instigation of the Union, this was a project launched in 2015 to develop more accurate job descriptions and to establish a system of pay grades for all staff positions at Columbia College Chicago. A consultant, Mercer, was hired, and they reviewed questionnaires that employees filled out about their job responsibilities, duties, and requirements. It was quite extensive! Mercer also included salary market data in their analysis, and came up with a proposed pay grade structure. Union leadership, staff on the original Steering Committee and the current team, along with HR, have worked to revise the structure and to clarify and refine the forms and processes involved. We are now in the first phase of implementation. Your position was assigned to a job level, aka job grade, based on a number of factors pertaining to your job position, including your job duties and responsibilities, required skills and education, task complexity, and the scope of individual discretion and judgement needed in the job. Your position will also be grouped into a Job Family, based on job type. You may be able to use the Job Family to help you compare jobs similar to yours for the purpose of an appeal. This first phase is essentially completed, with an upcoming appeal process described below. What is the next phase of the job study? In the next phase of the project, the USof CC will negotiate appropriate pay scales for the 8 grades reserved for bargaining unit staff. The union will add our own research based on comparisons of local schools similar to Columbia College College. There will be a range of pay per level with a minimum, midpoint, and maximum rate, with some overlap between ranges for adjacent levels. The higher the job level, generally, the higher the pay range will be. The immediate effect on you will depend on where your current salary falls within those pay ranges now. If your pay is within the range for your level, there may not be an immediate effect. The union will also negotiate clear and objective standards for staff to move along the range from minimum to maximum pay rate at their assigned job level. Will I have an opportunity to find out more about my job classification? The rubric developed by the consultant and HR, called the Leveling Guide, used to assign positions to job levels, was discussed and revised by HR and the union in committee. HR now uses the Leveling Guide to assign new positions, and positions that weren’t included in the original study. Wait—I don’t know my Employee ID! Don’t worry—a union rep created a visual step-by-step guide to finding your employee ID, and that will be posted on IRIS as well. How will I be able to tell if I’m in the right slot or not? Ah—this is where your Union comes in. Once you’ve reviewed the “Leveling Guide” or rubric, you may still have many questions about your position placement. Understandable! Volunteers from the Union can help you determine if your position is in the right slot in several ways, which also should inform your decision about submitting an appeal. We can translate the HR jargon in the leveling guide, since we’ve hashed it over at length in meetings! You can email usofcc@yahoo.com and a volunteer union member will try to answer your questions. Read the Union newsletter! We are also planning to throw some “Appeal Process Pizza Parties” to gather as a group to fill out the Appeal Form and help each other out. Volunteer representatives from Union leadership and membership will be on hand to answer questions and help guide you through considering an appeal and the appeal process. See above. Also, check the Union website for updates, and volunteer to host an Appeal Process Pizza Party! What’s all this about an appeal? How does that work? After you’ve reviewed the information from HR and the Union about your position and pay grade and job family assignments, you will have an opportunity to gather evidence and submit an appeal to request that your job level be upgraded. Please note that the appeal is based on the requirements and duties of your position, not on any factors or skills pertaining to you as an individual. IMPORTANT: You will have 30 days after the information is released to submit your appeal. See above for resources available to you to help you determine whether you have a good case for an appeal, and what sorts of evidence you need. The email announcement and the appeal form include detailed instructions as well. What does the Classification Study NOT do? It does not increase my pay. There is a different process for working with HR on issues of temporary work duties, workloads, upgrades, stipends, and pay increases. How can I get my compensation changed? I am doing way more work now! First, you may be able to appeal your job classification level based in part on this factor. Once you feel you have been assigned to the right job level, compensation changes will depend on the negotiations process for the second implementation phase of the Job Study and on bargaining for our new contract and raises. For now, there is a process already in place to work with your supervisor and HR to request an upgrade, stipend, or salary increase. See the link above and feel free to ask us for more information! What is the timeline for this part of the implementation phase? Once you have your appeal determination, within 15 days you will have the option to request a personal meeting with HR to clarify and/or supplement your appeal basis to try to affect their decision. Please copy the union on this email request; a Union representative will attend that meeting with you. The Job Classification and Appeal phase will last 45 days plus time for appeal reviews and determinations, and any additional meetings scheduled with HR post-determinations. If your appeal determination result is still not satisfactory, your issues and concerns could still be addressed in the usual bargaining process. In the next phase of the project, the Union will begin bargaining the pay ranges and starting values for the pay grades in the pay structure. Note that the negotiated pay band for your job level may or may not result in a raise for you depending on where your salary falls within the pay scale. Negotiations for the new contract will probably begin during, and overlap with, this phase. Join the Negotiations Committee or Contract Support Team to add your energy to the next push to benefit our whole membership! Surprise! The 2015 Job Classification Study is now moving ahead. Yes! Really! We know it has been awhile, but your union reps have been working behind the scenes on your behalf. And now, let the implementation phase begin! For those of you who were not here for the joy of JDQ (Job Description Questionnaire) or simply don’t remember much about it at this point, the Job Classification Study was a project originally instigated by the union to streamline and structure the hierarchy of job positions and provide a system of pay grades, or as HR calls it, job levels. The idea was to make our job titles and hierarchies more in line with other institutions, to make the whole system more transparent and understandable (making it easier to negotiate), as well as to provide up-to-date job descriptions for all staff. In the next phase of the project, we’ll be able to bargain the salary ranges for those pay grades. For now, whether you were part of the original JDQ process or not, your position will have had a job family and job level assigned to it, by the consultant and/or by HR. HR will continue to use the rubric developed by the consultant in the project, called the Leveling Guide, to assign pay grades to new positions. USofCC reps and HR staff have hammered out the number of levels and the language in the rubric, as well as the communications and appeal process details. Your union volunteers worked long and hard to make the Leveling Guide and the communications emails clear, and to advocate for your rights in this process. HR plans to send email announcements and to officially release the data about your job family and job level assignments on June 1st on the IRIS platform. PLEASE TAKE NOTE: After the release date, you will only have 30 days to appeal your job family or job level assignment. Confused already? Never fear, USofCC is here! We want our members to know where they stand and to fully understand the new system and the steps in the process. We will be involved every step of the way, from providing information and answering questions, to offering support during the appeals window, and beyond. First, please come to one of the three informational sessions over the next couple of weeks—they are at different times and places to make it easy for as many people as possible to attend. Members and officers will be on hand to answer questions. We’ll show you how to determine whether your assigned job family and job level fits your position, or whether you might have a good case to appeal it. We know that a lot has changed since 2015! We can also make suggestions about how to build a strong appeal. Remember to check the USofCC website https://usofcc.org/ for updates and further information. You can always email the union directly and we will do our best to answer your questions. Watch your email and read the union newsletter too! Letter from the President: Overtime, 40-hour work week and exempt status for Union members. 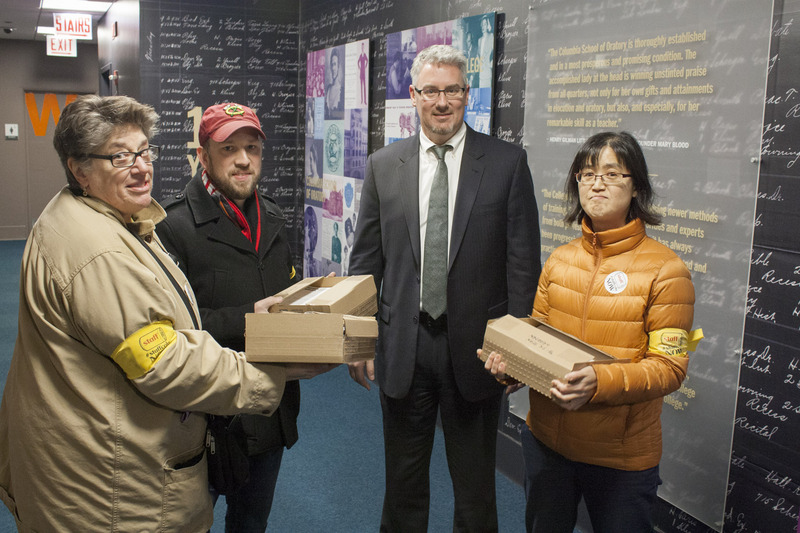 The Union has been in discussions with the College’s Labor Management team regarding possible changes by the College in how it compensates staff for overtime hours (time worked beyond the 40-hour work week). Until recently, the College has paid Union staff overtime, (time and a half), for all hours worked beyond a member’s normal 40-hour work week, including Saturdays. In the past year, the College implemented Preview Days that required many staff to work Saturdays. In order to avoid paying overtime pay, departments informed staff members that they would have to shift their schedules and take an alternate day off during the week to avoid exceeding 40 hours. This approach would put students and departments at a disadvantage by leaving less staffing during the regular work week. Additionally, working Saturdays can be a hardship for many members with families, 2nd jobs, or other responsibilities. Finally, it would deprive those staff who did work Saturday from receiving overtime pay. We are pleased to say that our Union was successful last month in getting the Admissions Office agreement to cover the overtime cost of members who worked weekends. While the Union supported the College’s efforts to attract and retain students, Union staff should be properly compensated for their time. Lastly, there is the issue of the College classifying some Union members as “exempt.” Doing so would prevent staff from being paid overtime due to the nature of their work and responsibilities. This status is mostly applied to those members who are highly compensated and exercise a significant amount independent judgement in their roles as professional employees. The standards for this are established by the Department of Labor. Human Resources has assured us that they will “only evaluate future positions that became vacated through attrition or as a new position or in response to a complaint.” However, should there be an issue presented regarding exempt status, we will need to confirm that the designated of the position is properly classified. Also, we requested that employees be told they are being hired as an “exempt” employee or being reassigned as an “exempt” employee. “Exempt” status can greatly affect compensation. In upcoming negotiations, the Union will propose that exempt employees be provided with compensatory time, which is allowed for under the law. Have you been denied overtime? Has your department claimed their budget will not support overtime? These issues and other important concerns will be part of our Contract negotiations this Summer. Would you like a Union representative to explain these issue in person? You can organize a meeting for your department, unit or building floor’s Union members, and we will bring food and discuss these issues with you. We want to learn from YOU what is going on in your area, and we want to help and explain how to protect your rights. Please contact Craig Sigele at csigele@colum.edu. Join the Contract Action Team (CAT). Protect your rights, get involved! We are here to help and want and need you to be engaged! We can only be effective if we have active participation from everyone. We need you to stand up with all of us and get involved. Contact Oscar Valdez ovaldez@colum.edu Flor Calabrez fcalabrez@colum.edu or Kayla Jutzi kjutzi@colum.edu and tell them you want to participate in protecting your rights and the rights of the Union. I write with a few updates and information about our first General Membership meeting of 2018. The Board had a very successful meeting with Dr. Kim at the end of last semester. We discussed some concerns we had regarding a recent shift, from paying overtime, to changing staff member schedules to accommodate special college programming. While the Union supports new recruiting initiatives such as multiple Admitted Student Days, some departments were requiring staff to shift their schedules which would have required staff members to work on Saturdays avoiding overtime compensation. Working with Human Resources, the Grievance Chairs fought to protect our right to overtime. However, attempts to alter our schedules will, I fear, become more common and we will need to be vigilant to protect scheduled work hours. Currently, the Grievance Chairs continue to work to protect staff members from taking on additional work without additional compensation. The Union understands the pressures caused by the continued decline in enrollment and we support all new systems and programs the Administration develops to improve the College’s standing But, additional work needs to be recognized and valued with additional applicable compensation. Added duties, shifting schedules and the dissection of our 40-hour work week are issues we are confronting as college resources become tighter. On March 12, we will host our first General Membership meeting of 2018. Please mark this date on your calendar so you can join your colleagues at noon on the 1st floor of the 623 building. We will be serving lunch and discuss the activities of your Union. I urge you to participate – we welcome and need your voice. To prepare for the meeting, we need you to complete a survey using this LINK (to come). This survey will collect information about your Columbia working experience in an effort to understand your needs and concerns as we prepare to negotiate a new contract. The standard items are on the top of the list, salaries and health care, but we know you have many other concerns and we need to hear from you, so please take five minutes and complete the survey. At the Membership meeting, we will discuss some of your findings. In other news – some informational items I hope you will find helpful: When you go to HR, let the union know. HR is here to protect you, but they also represent our employer, Columbia College Chicago. The Union represents staff and considers your needs first. We need to hear from you, if you have issues or concerns about practices in your department. We encourage you to visit HR , but please keep the union informed. Had we not heard from our membership about the push to avoid overtime, we would not have been informed to fulfil our mission to protect you. Admitted Days affects many departments and staff. May Layoffs need to stop. Columbia will not succeed if they continue to cut staff. Top administration need to share the burden of layoffs with all college members. I am very encouraged by the dedication and energy of our Negotiation team. Their efforts need to be matched by a strong and creative Contract Support Team. This group will become the face and voice of our negotiations. We need spirited members to take our message to the community, so our demands will be heard. This group will help us to present a united and strong front in face to the administration. Please consider joining, lending your time and energy. Nothing is more rewarding than fighting for your rights and protecting your benefits. Thank you for all you do for Columbia College, for our students, and for our union. The Part-Time Faculty Union (Pfac) has announced it is taking a strike vote this week and is planning a two-day strike on Wednesday, November 29th, and Thursday, November 30th.Individual members of United Staff of Columbia College (USofCC) are free to show support for the Pfac membership, as long as they comply under the staff contract that members are required to report to work and perform their jobs during a strike by another Union. 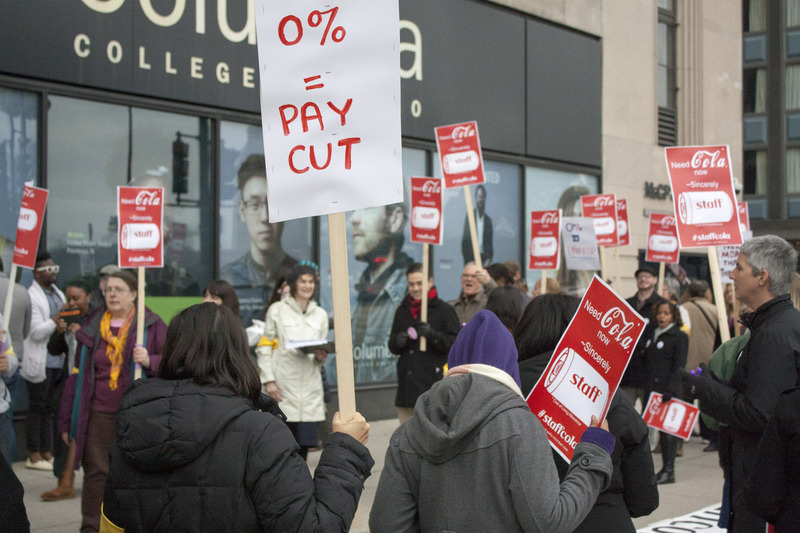 USofCC will uphold Article 8 in the 2015-2018 contract with Columbia College Chicago, which states that USofCC members cannot, under the risk of discipline, engage, encourage or sanction any strike, sympathy strike, sit-down, boycott, picketing or any other action that will interfere with regular operations at the institution. If you have any questions regarding Pfacs announcement, please contacts us at usofcc@yahoo.com. Please include your name and address, your local (United Staff of Columbia College) and indicate which levels of contact you want stopped.